This Kirkland Dog Food review will leave you wondering where this brand has been hiding for so long—a comprehensive look at the dog food that’s been flying under the radar (but not for long). It’s no surprise that large franchises are capitalizing on the pet food market and Costco is no exception. 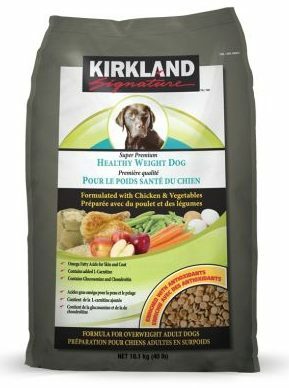 Kirkland Dog Food is made and distributed by Costco, a bulk store here in the USA. Many pet owners have questioned is Kirkland Dog Food good for their pup and we’re excited to look into this question to determine whether or not this dog food is of top quality. With grain-free recipes and probiotics infused in each recipe, Kirkland Dog Food has great benefits to offer your furry friend. We give Kirkland Dog Food receives a super premium 4.5 out 5 stars rating. This is not your typical dog food brand on the market and it is clear that customers like this dog food as well as the well-known brands out there. From a customer review standpoint, Kirkland brand dog food reviews show that pups are happy and healthy with this dog food. Many customers reported their dogs looking healthier after eating this particular brand (healthier skin and coats, better weight, etc.). When you take a look at the ingredients, you will see that chicken is one of the top ingredients. While this is a quality ingredient, it can be a trigger for some dogs’ allergies so it’s not the top choice for ingredients. 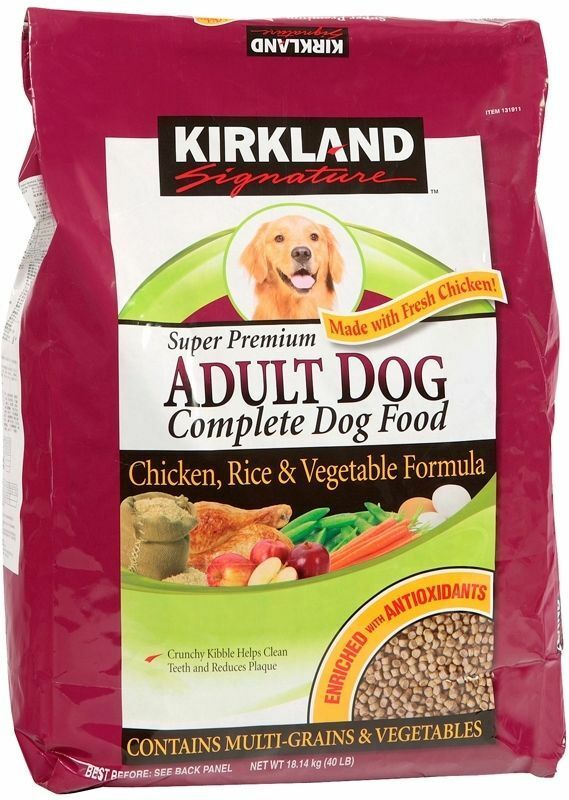 However, there is a drawback with this product: you can really only purchase Kirkland brand dog food at Costco. Amazon.com does have one product available for online ordering, but that is it. Overall, when you ask how good is Kirkland Dog Food for your pup, you can rest assured this is a good choice for your pup, and your pup will certainly thank you. Customers reported that their dogs were healthier after switching to Kirkland brand dog food. Their pups were at a healthier weight, had better skin and coats, and seemed to have an overall boost in energy. Obviously when you buy anything from a bulk store, you are going to get a great value. Kirkland brand dog food is no exception here. Customers were very happy with the price of the pet food and the quantity of dog food they received for the price. Furry friends all over are enjoying the great taste of this dog food every day! Reviews on Kirkland brand dog food show that picky eaters are no longer picky anymore; they’re gobbling this kibble right up. Some customers reported that the transitioning process for their pup was not an easy one. Reports of gastrointestinal issues were reported along with upset stomachs for some dogs. This was not a common theme; however, so it is fair to say that these were isolated incidents. 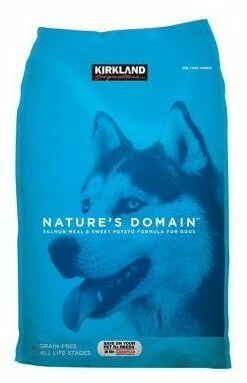 Because Kirkland brand dog food is sold at Costco exclusively, this is not an easy brand to find regularly. Amazon.com does sell one product from this line, but for the most part you have to travel to a Costco to get the food! Kirkland brand dog good reviews show that this is a bit of a problem for many customers. One of the key elements to be noted in the ingredients is the use of mostly meat products. There is a great deal of meat used in the ingredient list and this a really positive thing for your dog! What that means is that your dog will receive more meat and less fillers like grain. There are not many recipes offered that are grain free, which means the recipes have rice, wheat, soy, etc. These grains are known for causing issues for pups with allergies. 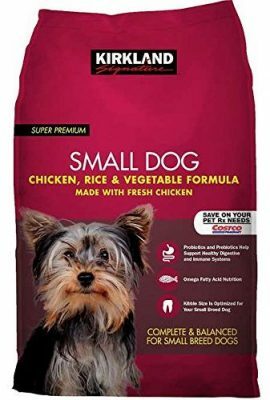 The ingredient list does show that ingredients are above the average ingredient list for comparable dog food, which is a really positive thing for this relatively unknown dog food. According to the FDA’s website, there are no recalls listed for Kirkland brand dog food and subsequent products in their line. It seems that Kirkland brand dog food reviews are proving that this is an underdog in the dog food market. Not too many people know that Costco has dog food, especially not this type of quality of dog food! If you have a Costco around your city, it is worth giving Kirkland brand dog food a shot—your pup might just think you’re the best thing since sliced bread. Re: JH’s claim of pet illness. Apparently this stems from fake complaints that have been confronted and withdrawn (see links below). PLEASE be careful of repeating claims that are not verified. This not only hurts a reliable company but pet owners as well. I spoke with our vet this morning and he highly recommends Kirkland Signature Dog Foods. He feeds his prized labrador retrievers this brand! That’s good enough for me! My son also feeds his dogs this and they are thriving! I’ve read just about every dog food/type of diet blamed for illness and death. Unfortunately, sometimes dogs develop illnesses and if a particular cause is not identified the food is blamed. Made by Diamond Pet Foods. Check it out. How come the packaging no longer has made in the USA on it? 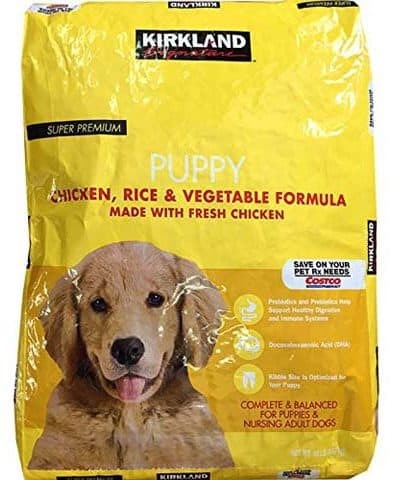 The Humane Society uses this brand of dog food because it is high quality. I have fed my dogs this food for 2 years and feel it actually corrected the stomach issues my Lab was having. I haven’t found any problems with Nature’s Domain! One of my 4 pits has allergies & stomach problems..she can’t have chicken but eats Turkey & potato..why is that not reviewed?? My little pit with skin & stomach problems does so well on Turkey & potato but it’s not reviewed! Why not?? Companies adjusting size but keeping the price the same is something that happens across the board with all foods. Good luck finding anything remotely close to what Costco sells for. Even with the lower sixe it’s still fairly cheap. This is an excellent dog food. I have a pit mix we switched to Kirkland after research. My dogs old food was discontinued so I had to switch abruptly which did give my dog some diarrhea which is expected because I couldn’t ween her off the old stuff. She is doing so good. She’s shiny and not dried out her fur. She lost her big belly. No pink she’s a pit mix known for allergies. No pink anywhere. We use the turkey Neal sweet potato blend. She has fur were there was none. I’m very satisfied. Costco has a 35 pound bag for 28.99$. Hubby brought one home with a rip. Made him take it back. They were wonderful at Costco no problem.